Tanna of the second century; contemporary of Simon b. Eleazar (Tosef., 'Er. vii. [v.] 9); and quoted in some baraitot in connection with halakot and with haggadot (Tosef., Shab. xvi. [xvii.] 10; Mek., Beshallaḥ, Shirah, i.; Tan., Beshallaḥ, 11). Nothing is known of his history, and, as is the case with many others, the exact version of his prænomen can not be ascertained. The Tosefta (l.c.) reads "Eleazar," and so does Yerushalmi (Shab. iii. 5d. ; 'Er. vi. 33c); while the Babylonian Talmud (Shab. 123a; 'Er. 71b) and the Midrashim (l.c.) 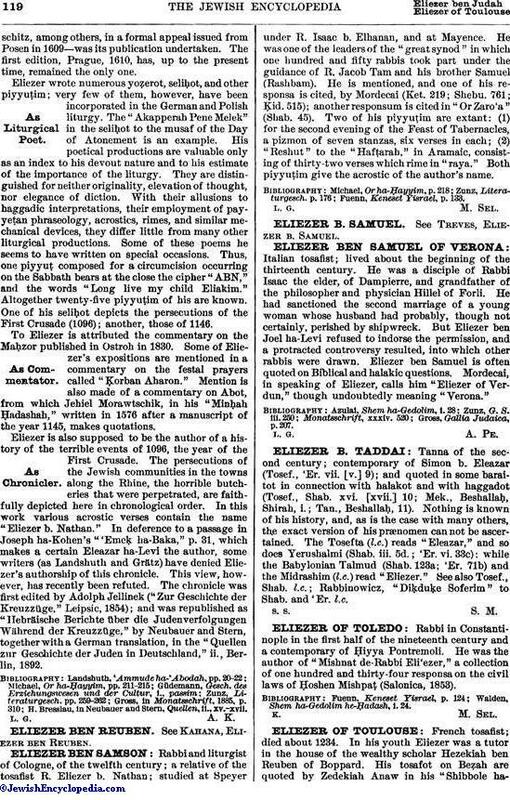 read "Eliezer." See also Tosef., Shab. l.c. ; Rabbinowicz, "Diḳduḳe Soferim" to Shab. and 'Er. l.c.